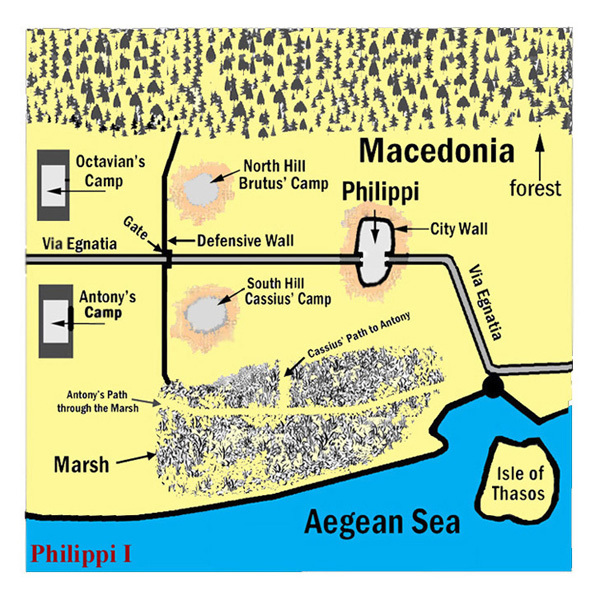 Click First Battle of Philippi for a “FREE” download of this page in PDF format. Brutus and Cassius approached Macedonia from the east, travelling west from Asia (current day Turkey), through Thrace. When they reached Philippi, a small hill town with springs and streams, they set up their camps. Mark Antony marched his army in from the west. He set up camp about a mile away from Cassius’ hill. Octavian and his army had not yet arrived because he was ill and still back at the port city of Dyrrachium on the west coast of Illyricum (current Albania). It was at this point that Brutus and Cassius had their best chance to defeat Antony. They held a superior position with a superior number of men, but they didn’t attack. Octavian arrived several days later and set up his camp opposite Brutus’ hill. In the first week of October 42 BC, the battle was joined. Antony defeated Cassius, but Brutus charged Octavian’s army and drove them into retreat. Octavian was not in his camp when Brutus’ army attacked. Laid up with an illness, he’d been carried away earlier to a safe place in the woods and placed on a makeshift bed. Had he been in his camp, he would’ve been killed because the enemy soldiers quickly destroyed his tent, thinking he was in it. After the battle, an excited Brutus raced back to the Philippi Hill to tell Cassius about his victory. When he arrived he was shocked to find that Cassius had committed suicide. The speculation was that he did it for one of two reasons; that he realized Brutus had won and his pride would not let him be second to him, or that he could not live with himself for not having attacked Antony when he held the superior advantage. Either way, Cassius was dead, and a nervous Brutus was now in command of their combined armies. Octavian recovered from his illness. There has been some question as to whether he was sick from a physical illness or sick from a fear of being in battle. In later battles and events in his life, he demonstrated fearlessness and bravery perhaps combined with an appropriate amount of caution. Whatever the truth may be, the same historical record that raised this suspicion in the “First Battle of Philippi” has him heavily engaged in the “Second Battle of Philippi,” which occurred three weeks later.